Home » SPECIAL OFFERS! 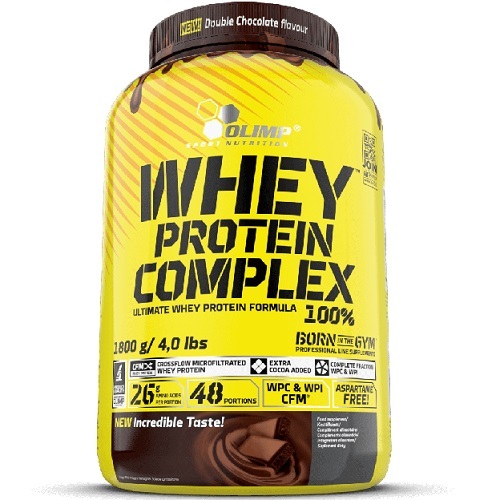 » OLIMP WHEY PROTEIN COMPLEX 100% - 1800 g + FREE SHAKER! 95% protein-mix (ultrafiltrated whey protein concentrate WPC (from milk), whey protein isolate WPI – CFM® (from milk)), aromas, medium-chain triglycerides oil (MCT oil), fructose, acidity regulators – malic acid, citric acid (for all strawberry like flavours), acidity regulators - sodium citrates; thickeners – gum arabic, xanthan gum, sodium carboxy methyl cellulose; sweeteners – acesulfame K, sucralose, cyclamates; emulsifier – soy lecithin; salt (for all chocolate like flavours), colours: carmine (for all: strawberry, cherry, strawberry-kiwi and banana-cherry like flavours), E 150c (for all: cookies cream, toffee, chocolate, coffee, ice coffee, hazelnut, tiramisu and cappuccino like flavours), riboflavin, E 133 (for all pistachio like flavours). Take 1-3 portions a day – before breakfast, between meals, after training or before sleep. Add 1 portion (35 g = 1 scoop) to 150 ml of water. Consume directly after preparation. Not suitable for diabetics. Do not exceed the recommended daily dose. Food supplements should not be used as a substitute for a varied and balanced diet. Keep out of reach of children. A varied and balanced diet and a healthy lifestyle are recommended.